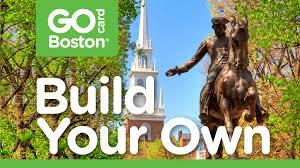 Established in 1634, Boston Common is America’s oldest public park. Puritan colonists purchased the land rights to the Common’s 44 acres from the first European settler of the area, Anglican minister William Blackstone. Designed by Charles Bulfinch, the ‘new’ and current State House has served as the seat of Massachusetts government since its opening in 1798. Holding the legislative and executive branches, it sits adjacent to the former site of the historic Hancock mansion. The church was founded in 1809, at the corner of Park and Tremont Streets, atop the site of Boston’s town grain storage building, or granary. Designed by Peter Banner, the 217 ft. steeple of Park Street Church was once the first landmark travelers saw when approaching Boston. Established in 1660, some of America's most notable citizens rest here. Named for the 12,000-bushel grain storage building that was once next door, the historic burying ground has approximately 2,300 markers. Founded in 1686 as Boston’s first Anglican church, King’s Chapel is home to over 330 years of history. The 1754 granite building still stands on the church’s original site: the corner of Boston’s oldest English burying ground. Boston Latin School, founded on April 23, 1635, is the oldest public school in America. It offered free education to boys - rich or poor - while girls attended private schools at home. Until the completion of the schoolhouse in 1645, classes were held in the home of the first headmaster, Philemon Pormont. A mosaic and a statue of former student Benjamin Franklin currently marks the location of the original schoolhouse. Constructed in 1718, the Old Corner Bookstore is downtown Boston’s oldest commercial building and was home to the 19th-century publishing giant Ticknor and Fields, producer of many venerable American titles including Thoreau’s Walden, Hawthorne’s The Scarlet Letter, Longfellow's Midnight Ride of Paul Revere, and the Atlantic Monthly including Ward Howe's Battle Hymn of the Republic. Saved from demolition in 1960, the building’s leases help subsidize important historic preservation projects in Boston’s neighborhoods. Experience history where the Boston Tea Party began! This hall rang with words from Puritan sermons, public meetings, and the tea tax debates - visit Old South Meeting House and add your voice to history. Through Massacre, Revolution, and fire, the Old State House stands as the oldest surviving public building in Boston. Built in 1713, the building served as the center of civic, political, and business life. On March 5, 1770, after months of tensions due to occupation and taxation, Bostonians and Redcoats clashed in the streets of Boston. What ended with five civilians killed by gunfire, Crispus Attucks, Samuel Gray, James Caldwell, Samuel Maverick and Patrick Carr, led to the rallying of Bostonians against the Crown and the evacuation of troops in Boston. They would not return until 1774. Often referred to as "the home of free speech" and the "Cradle of Liberty," Faneuil Hall hosted America's first Town Meeting. The Hall's vital role in revolutionary politics had not been part of its original plans, but it became home to an intricate collection of events that shaped the nation's history. Built around 1680, the Paul Revere House, owned by the legendary patriot from 1770-1800, is the oldest remaining structure in downtown Boston and also the only official Freedom Trail historic site that is a home. Named after shoemaker William Copp, Copp’s Hill Burying Ground is the final resting place and burying ground of merchants, artisans, and craftspeople who lived in the North End. Launched in Boston in 1797, USS Constitution is the oldest commissioned warship afloat and earned her nickname "Old Ironsides" during the War of 1812 when she fought the British frigate HMS Guerriere.